I'm of a certain age that when I grew up the radio was a vital part of my life. Whether listening to classic rock on Rock 104 WXKE "The Real Rocker"; the top 40 pop spewed out by 97.3 WMEE; or Metal Shop on Niles, MI 95.3 WAOR every Friday night, I was never truly alone. I could always turn the dial and find someone willing to hang out and spin some tunes with me. Even up into the 80s the radio station played an integral part in our lives. It was still personal. It was still 'ours'. But within the last 15 years or so radio has lost its soul. As we speak, our favorite radio stations' mojo, their essence if you will, is being lambasted, pitchforked, drawn and quartered and devoured in FM dial purgatory. Not by fork-tongued, razor-toothed demons from Hell. No. They're being filleted by fork-tongued, razor-toothed executives at Clear Channel, CBS Radio and Entercom. I'm not a puritan. I know how the world works. Money talks and ones that stand for something more get put in a burlap sack with some rocks and are thrown into the river. Whoa, Negative Nellie. Alls not yet lost. You see, the point of all this is to tell you that there is hope. There are good souls out there that want to bring the glory of the radio dial back. They're still keeping the FM fires burning. One such radio station is WCYT, Homestead High School's very own 'school' radio station. 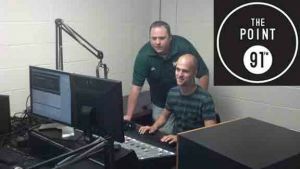 Station manager and Homestead Radio teacher Adam Schenkel and music director, marketing manager and former Homestead radio student Andy Dunn have created Fort Wayne's only indie rock station. They are bringing back the vibe of what a radio station used to bring, which is taking requests, listening to their listeners, and just doing what a radio station is supposed to do: playing tunes we want to hear. "Homestead High School was granted a new radio station in 1993 and got everything up and running and on the air in 1995", says WCYTs Adam Schenkel. "WCYT is one of the newest stations around as it isn't typical for the FCC to grant new radio frequencies. So if schools want to obtain a real FM/AM station nowadays, they will have to buy one already in operation. It has been on the air 24 hours a day, 365 days a year since 2002 (minus the summer off in 2004)." So if you're reading this Carroll High School, be forewarned; that hip hop radio station is gonna cost ya. While Adam and Andy make up the motor that drives the station, without the pistons firing you're not going anywhere. And WCYTs pistons are students. Students like Nick Sims and Adam Breneman, producer and asstant music director respectively. Students also have after school radio shows. Folks like Rich Matera, Colby Shoup, Matt Hamilton, Drake White and Alec Pena all spin the tunes that get you from point A to point B after work. Hats off to ya, ya whippersnappers. In all honesty, if these guys wanted to kowtow to the masses they could've gone with, say, a hip hop station or country. Indie rock, although my bread 'n butter, isn't really McDonalds or Walmart. Meaning, it's not generic, faceless, mass-produced and artery clogging like so much of popular radio these days. Why indie rock? "When I was hired in 2004, I wanted to make it more true alternative,” says Schenkel. “There wasn't much Nirvana, Pearl Jam, Soundgarden, Smashing Pumpkins, etc., on the station then. I began adding a ton of 90's alternative music to the playlist. Eventually, we became the only rock/alternative station in Fort Wayne. We played on that for multiple years, but in 2010, new music director Brady Gerber (Sr at the time) started adding more Indie bands/songs. I loved a lot of them and really liked the new additions. This coincided with Andy Dunn graduating from IU and moving back to Fort Wayne. He and Brady collaborated in the summer of 2011 and I gave Andy the job that he had for two years as a Homestead student six years earlier. My job got easier because I just let Andy do his thing minus one simple rule: You aren't getting rid of Pearl Jam (my inside joke, by far my favorite band)." So, Andy? "I was the music director while in high school 2004-2006, when I was a freshman the station was an adult alternative/pop station,” says Dunn. “Music could come and go and lacked a direction on who we wanted our audience to be. The following year a new leader took office. This student had big ideas for the station yet lacked the devotion and conviction to truly form his vision for the radio station. This former music director was making the leap to turn our sound into a 98.9 the Bear clone. His interest started to wane by the halfway point of the school year and that is when I started giving my input on the songs we should play. I was completely against the idea of the Point 91 FM playing the exact same thing as The Bear. I knew we needed our own identity and brand. Something the people of Fort Wayne could not get anywhere in the city." Thanks to Andy's vision and Adam's tutelage, we now have a radio station(both in old school F.M. dial form, and in streaming beauty form a wcyt.org) as proof that life and great music still exist on the radio. I had to throw a couple of my theories about the soulless state of radio these days at the guys. Adam said, "That's funny, because when I teach the new kids about our station I tell them about new standards in radio — fewer DJs, voice-tracking replacing live DJs, more automation, digital technology. I tell them that is not the case here. We have the benefits of having a digital station with state-of-the-art equipment, but I want them to go on live, not pre-record breaks. We do take requests because it all about the listener. Most of the time, though, the listener picks a song that will play soon anyway...so we just shuffle up the playlist a little to bring it up sooner." So what's the future hold for WCYT? "We hope bigger and better things", says Adam. "Money is always an issue in public education, but we will look in to fundraisers and grants to help us make changes. Ideas on the horizon include a power increase (which won't necessarily make the signal go further, just make it more powerful and being heard inside buildings and such). Other things we could purchase is the ability to let us do live remotes with great quality, right now phone line is still the only option." Andy adds: "There should be a bright future for the Point 91 FM. If things fall into place, be on the look out for more new music, a lot more investment into our community, new features for the website and over the air, contests, listener involvement and much more. Next year could be huge for local radio and the Point 91fm." With the help of guys like Adam and Andy, plus a handful of dedicated teenage 'Johnny Fevers', all may not be lost for radio and the local airwaves. It all starts with a couple guys wanting to make a change, and some hungry ears ready for it. 201 people	reviwed this story with an average rating of 2.0.